In this blog post, Lucy Bell and Alex Flynn describe one of the independent book fairs in which they accompanied Dulcinéia Catadora in March 2018 – the Junta-feira. The article explains some of the political contexts (from Rousseff’s impeachment to Temer’s neoliberal reforms) that make such cultural activities so relevant in Brazil today, and includes unpublished materials from an interview with the fair’s curator, Paula Borghi. Last summer, Brazilian President Michel Temer announced a series of reforms that are set to privatize a large swathe of Brazilian companies, from the national lottery to the country’s largest power conglomerate, the electricity giant Eletrobras. These reforms, which echo Thatcher’s and Reagan’s neoliberal policies of the 1980s and post-2009 austerity measures, constitute the biggest wave of privatization in Brazil since the 1990s. Unsurprisingly, these government cuts and privatization initiatives are being justified as an attempt to get a handle on an economic crisis that started in 2015, bringing with it record levels of unemployment and ever greater gaps between the poorest and richest Brazilians. This crisis, in turn, is profoundly intertwined with the political upheaval which led to the so-called coup d’état and the subsequent overthrow of democratically elected President Dilma Rousseff in 2016. Against this backdrop of austerity, privatization and corruption, Brazil’s unions have been mobilizing through large-scale strikes and protests, including a nationwide general strike that saw the closure of schools, the disruption of public transport, and clashes between police and public-sector workers across Brazil. This spirit of protest has also infused Brazil’s carnival performances, culminating last month in Rio with the cry of “Temer out” by the Paraíso do Tuiuti samba school. Complementing these spectacular events, a range of Brazilian actors are mobilizing through small-scale, everyday interventions with equal levels of passion, commitment and energy. 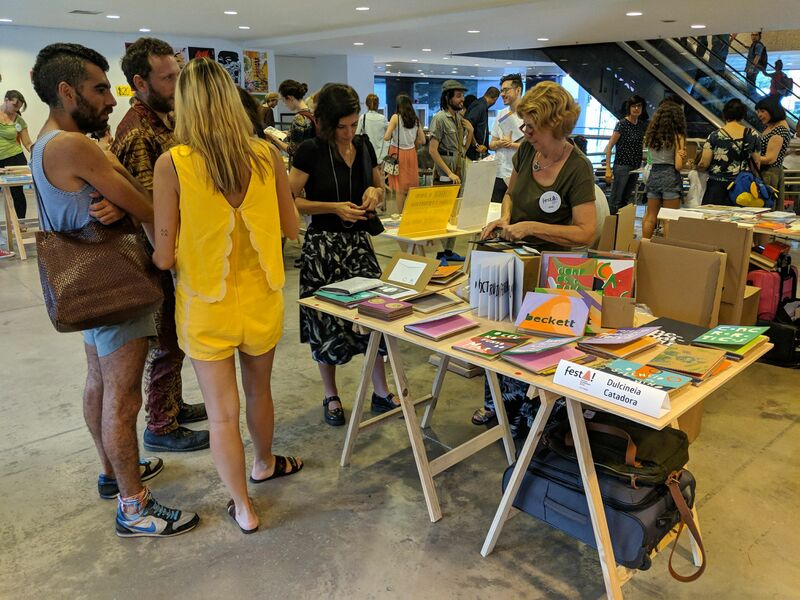 The Junta – Feira de Livro de Artista Latino Americano, an art book fair organized and curated by the Mercosul Biennale curator Paula Borghi and hosted by the Brazilian non-profit institution SESC Pinheiros in March 2018, São Paulo, is one such intervention. In an interview with Paula, she explained the significance of the fair’s name. Feira, in Brazilian Portuguese, refers both to a street market and to a fair, and junta is the name for a neighbourhood association or assembly. 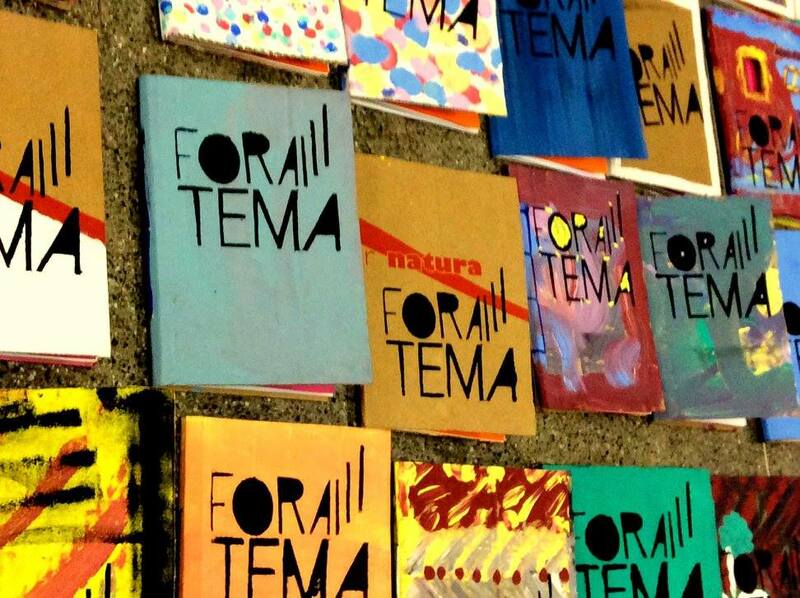 The Junta-feira, as people were referring to it, thus gestures towards principles of inclusivity, diversity and grassroots organization that characterize the Brazilian independent publishing scene. Walking towards the imposing SESC building last Saturday, a spirit of openness, community and festivity exuded from the fair and its participants. As well as the usual book fair crowd of students, collectors, and academics, open-air workshops were attracting families with small children and other passers-by. The Junta itself was inside, in spite of Paula’s desire to run it ‘on the street’ in order to make it an explicitly public event. Yet the way it was structured – with 9 invited guests and 12 stalls to be ‘occupied’ – set the tone. In fact, some of the participants were members of a nearby artistic occupation – the Ouvidor 63 Cultural Centre – who had come to sell their photographs, posters, and books. The participants of this fair are all committed, in one way or another, to ‘occupying’ spaces in Latin America’s mega-cities – from Buenos Aires to São Paulo – for the public good. 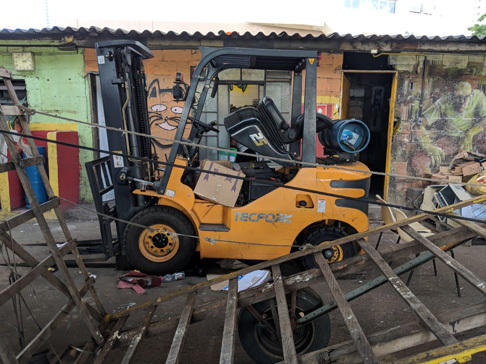 We spoke to Lúcia Rosa, one of the invited participants, who co-coordinates a vibrant publishing collective called Dulcinéia Catadora based in Cooperglicerio, a recycling facility, which itself is an occupation, in a marginalised neighbourhood of São Paulo. Dulcinéia’s model was inspired by that of the Argentinian collective Eloísa Cartonera founded in 2003 in the wake of Argentina’s 2001 economic crash. Like Eloísa’s founders, Dulcinéia works with waste-pickers from the collective to produce literary texts and art books out of waste materials (especially cardboard). Its ever larger and more varied catalogue of over 130 books includes works by well-known writers and artists (including Washington Cucurto, Horaldo do Campos and Paulo Bruscky) as well as by members of Cooperglicério itself (including Maria Aparecida Dias da Costa, Andreia Ribeiro Emboava, and Emineia Silva Santos). When asked about the importance of Dulcinéia, Paula Borghi highlighted two features. First, the fact that the collective shares the income from the books fairly, equally and transparently among those who produce them. In this way, it operates differently not only from other book sellers but also, implicitly, from Brazil’s most powerful politicians. Second, the price of the book is fixed and accessible (15 reais, or about £3). Both of these points highlight the highly political stakes involved in running an independent publishing collective. What Paula did not mention, but is central to the operations of Dulcinéia and other such artistic/social cooperatives, is that a significant part of their model is that of the workshop – a process that combines collective creation and manual labour with pedagogy and literacy. Indeed, Paula ran a very successful workshop that involved making a book as a group, based on the contents of the participants’ pockets – another gesture towards breaking down the barriers between private possessions and public good(s), personal life and shared experience. This pedagogical commitment to book-making and writing workshops is an explicit move by cultural activists to place education and literacy at the heart of their artistic endeavours. This comes at a time when the Brazilian government is cutting funding for schools, and, in more extreme cases, closing them down.